The concept of the ‘image of the child’ underpins a curriculum framework implementation draft, which Canada’s Nova Scotia government released in early 2018. The Department of Education and Early Childhood Development’s document is the first ever such document for the province. It is a solid read, spanning 97 pages and focuses on ages zero to eight. It’s part of the Canadian Federal Government’s decade-long, $7B multi-lateral early learning and childcare framework. In its introduction, Nova Scotia’s draft details the ‘Image of the Child’ as one “influenced by their own experiences, biases and knowledge”. In short, it’s taking a holistic view of the child including cognitive, social, emotional and physical development, but also trumpets ‘play’. Importantly, the framework picks up a theme that’s been promoted throughout the early learning and school education sectors – problem solving, experimenting and inquiry. The framework emphasizes this, says Nancy Carlsson-Paige, Professor Emerita of Education, Lesley University, Cambridge, Mass. USA. The framework tips its hat to frameworks of other Canadian provinces as well as New Zealand’s groundbreaking Te Whariki and Australia’s Early Years Learning Framework. What’s driving the framework is to make early childhood education “accessible, affordable and inclusive”. The provincial government has pledged $35M over three years to early 2021 for the sector to create 100+ childcare sites and improve subsidies for parents, too. The final framework was released in early Spring 2018. However, it is a living document that will continue to be reviewed and refined. There will also be a separate Indigenous Early Learning and Care Framework co-developed with Indigenous people. 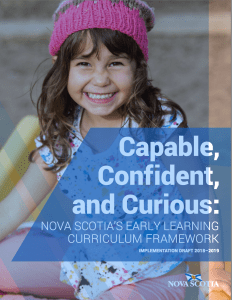 Educa has the Nova Scotia Early Learning Framework integrated as a curriculum option. Program Quality, which includes “engaging” with the Nova Scotia framework — measured through a self-assessment, and strengthened through a Continuous Quality Improvement process.